Located 1 mile away from Pharr International Convention Center, this hotel features an outdoor pool. It serves a daily continental breakfast. All guest rooms offer free Wi-Fi. 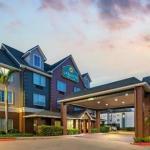 A flat-screen cable TV is provided in each air-conditioned guest room at La Quinta Inn & Suites Pharr. All of the pet-friendly rooms include a microwave, a refrigerator and a hairdryer. A 24-hour reception greets guests of Pharr La Quinta. Guests can work out in the fitness centre. A business centre is also available. Basilica of Our Lady of San Juan del Valle is 4 miles away from this hotel. McAllen Miller International Airport is 11 minutes’ drive away..